The Green Bay Packers continued their revenge tour on Sunday, beating the San Francisco 49ers, 17-3, at Levi’s Stadium, running their unbeaten record to 4-0 with a dominating defensive effort. In successive weeks, the Packers have now vanquished the Seahawks, who beat them in the 2012 Fail Mary and 2014 NFC Championship games, the Chiefs, who handed them their only regular-season loss during the 15-1 2011 campaign, and the 49ers, who had defeated them in four straight contests, including in the 2012 and 2013 playoffs. With payback on their minds, Clay Matthews and the Packers defense played like they had an ax to grind, relishing every opportunity to lay out San Francisco quarterback Colin Kaepernick, who had terrorized them in previous matchups. Green Bay held the 49ers to just 196 yards, including just 77 rushing (20 on eight carries for running back Carlos Hyde). Meanwhile, Aaron Rodgers and Co. passed a stiffer-than-expected test from San Francisco’s defense, protecting the ball, moving it well on the ground and converting through the air at critical moments. The Packers are 4-0 for the first time since that 2011 season, when they started 13-0 before falling to the Chiefs, with a couple of home games coming up before their Week 7 bye. — Perhaps Nick Perry won’t be considered a draft bust after all. The 2012 first-round pick, who missed 16 games in his first three seasons due to injury, has been healthy and hard-charging as an edge rusher this year. Through four games, he has three sacks and a forced fumble. On Sunday, he had two sacks, including a particularly impressive one where he soundly beat 49ers Pro-Bowl left tackle Joe Staley. In the final year of his rookie contract, Perry potentially is making a case for a return to Green Bay. — The Packers offensive tackles struggled again. The much-maligned play of left tackle David Bakhtiari and right tackle Don Barclay, who bookend an otherwise outstanding offensive line, continued on Sunday, as both struggled with San Francisco’s outside rushers. Outside linebackers Aaron Lynch (two sacks) and Ahmad Brooks (one sack) were relentless coming off the edge, as both players’ bulk and strength (Lynch is 270 pounds, Brooks is 260) gave their counterparts fits. On the Packers’ two biggest pass plays, a first-quarter touchdown to Richard Rodgers and a third-quarter bomb to James Jones, the mobile quarterback was moving around and shifting throughout the pocket to avoid the rush. — The run defense is for real. At least when they appear to focus on it, as they have the past few weeks and did again against the 49ers, the Packers can stop the run. Just like they did against Seattle’s Marshawn Lynch and Kansas City’s Jamaal Charles, the Green Bay defenders swarmed the ball-carrier with determination and effectiveness. The defensive tackles, led by a thinner and more invigorated B.J. Raji and the well-rested Letroy Guion, who played for the first time after serving a three-game suspension, penetrated and disrupted the backfield, the linebackers, led by Matthews and inside linebacker Nate Palmer, dissected San Francisco’s read-option and flowed to the ball and safeties Ha Ha Clinton-Dix (seven tackles) and Micah Hyde (five) helped finish off plays. It was an excellent overall performance, as the Packers shut down Hyde and limited Kaepernick to 57 yards on 10 carries (5.7 average). — Those specialists still give pause. Kicker Mason Crosby, previously perfect through three games, missed his first field-goal attempt of the season, a 44-yarder at the end of the first half. He did make a 31-yard try later, plus both extra points, and is 7 of 8 for the year. Meanwhile, punter Tim Masthay, who struggled last year and through most of training camp but seemed to be back on track, had a rough day. His six punts went for an average of 39.2 yards, but removing one 51-yarder, the numbers were five for 36.8, including one ugly shank out of bounds. Some games, the Packers’ juggernaut of an offense doesn’t need its punter; other days, like Sunday, Masthay must come through. — Clay Matthews wanted to send a message, literally, to Kaepernick on Sunday. After watching the 49ers quarterback run roughshod over his defense the previous three games – a 101.3 passer rating and 100.3 rushing yards per contest — and grandstand that success with his bicep-kissing celebration move, Matthews clearly decided enough was enough. The Packers linebacker had two quarterback hits on Kaepernick, including a sack after which he could be heard yelling, "You ain’t Russell Wilson, bro," and seen kissing his own biceps in mockery. — Still nursing an ankle injury that has limited him in practice the past few weeks, running back Eddie Lacy started in San Francisco and looked very good. He rushed 18 times for 90 yards (5.0 average), including several fourth-quarter carries to salt away the Packers’ win. His long run was for 15 yards and he had several others go for more than five. The production was needed on a day when change-of-pace back James Starks couldn’t get going (nine carries for 28 yards and a long gain of six). — Ty Montgomery wasn’t quite ready for prime time. On the first play of the game, Montgomery dropped what could have been an 80-yard touchdown pass from Rodgers on the outside. The third-round rookie only had three catches on his six targets in a game where starting wide receiver Davante Adams was out injured and the Packers needed someone to step up and take the pressure off Jones and Randall Cobb. — We see you, Sam Shields, even if opposing quarterbacks don’t. The Packers’ top cornerback registered his second straight game with an interception Sunday, picking off Kaepernick in the fourth quarter on a deep pass intended for veteran wideout Anquan Boldin. The steady play of Shields on one side allows the Packers to shade defensive help to the other side, where rookie corner Damarious Randall is benefiting from the extra coverage. It meant more than a win over a 1-3 opponent otherwise might, given the recent history between these two teams. The Packers defense, especially, seemed to be playing on raw emotion, which was verbalized by Matthews after his sack of Kaepernick. The Packers got a major money off their back and, in the process, asserted themselves as the team to beat in the NFC — and, perhaps, the league. Until he does something that proves he’s unworthy — or even human — Rodgers will continue to be named the player of the game here. Sure, it wasn’t his best performance; in fact, statistically speaking, it was his worst of the season. But a mediocre day for Rodgers still meant completing 68.8 percent of his attempts for 224 yards with a touchdown and, of course, no turnovers for a 99.0 passer rating. The NFL’s best quarterback makes everything happen for the Green Bay offense, enabling the running game to succeed because of the threat his passing attack poses, and despite multiple injuries to important pass-catchers. James Jones may have been the forgotten man for the Oakland Raiders and New York Giants, both of whom released the wide receiver before the season, but he’s made himself utterly unforgettable with the Packers. Signed on Sept. 7, Jones has become Green Bay 1-A receiver along with Cobb, catching 17 passes for a team-high 317 yards and four touchdowns. With less speed than he had during his seven-year stint in Green Bay that ended in 2014 but still possessing plenty of smarts, savvy and sticky hands, the cagey veteran made a catch in the in the third quarter that was jaw-dropping not because it displayed otherworldly athleticism but for Jones’ concentration and coordination. Running a post-corner route against excellent coverage, he hauled in the 38-yard throw right along the left sideline, tiptoeing his feet inbounds for a stunning reception. A few plays later, John Kuhn and the Packers scored the touchdown that gave them their winning 17-3 margin. 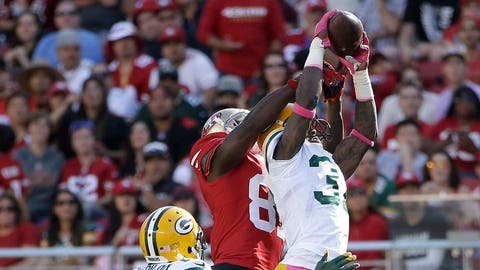 On second-and-8 from the 49ers’ 9-yard line, at the end of a nearly six-minute possession that started at their own 20, the Packers capped off a scoring drive with the first of only two touchdowns they’d score on Sunday. Rodgers took the shotgun snap with Lacy lined up to his right, dropped back a couple steps, bought time and looked downfield, spun around to avoid a rushing defender, stepped back up, then scrambled to his left away from the pressure and fired a low bullet to tight end Richard Rodgers in the end zone for a lead Green Bay would never surrender. 6 sacks. The Packers had seven quarterback hits on Kaepernick and brought him down six times. The previous week, against the Chiefs, Green Bay had nine QB hits and seven sacks. And for the second straight game, it was a collective pass-rushing effort on defense, as six different players notched a sack, including Perry with two. The Packers are now ranked second in the NFL with 17 sacks through four games. "In 2011, we blew a lot of people out. You need your defense to play like it did today, when you’re struggling on offense. . . . We have to do a better job completing passes. Without Jordy (Nelson), we lack some of that deep threat for sure. We make up for it by trying to be efficient." — Aaron Rodgers on the defense carrying the offense on Sunday. "We’ve got a lot of experience with these guys. We did a good job of stopping the run, and the way our team is designed, if we can stop the run, we have a high percentage of winning." — B.J. Raji on stopping the run against the 49ers, who’d had success on the ground against the Packers in the past. "Everybody’s had a piece of the pie the last two weeks. We just have to keep it up. It’s satisfying to do it for two weeks. We have to do it for 16. . . . We have to keep this thing going. It’s a very cohesive unit, we’ve been very close, and we should be in contention for bigger things." — Clay Matthews on the defense playing better and having 13 sacks in the past two games. "Hell, yeah. This is Week 4 in the NFL. You have to find ways to win these games. It’s never as clean as you’d like and not as bad as you think, either. We have to continue to grow. At the end of the day, it’s about your football team." — Mike McCarthy on if the Packers can still play even better as the season goes on. Next week, the undefeated Packers host the St. Louis Rams (2-2) at 12 p.m. CT on Sunday at Lambeau Field.